Lasagna with Cottage Cheese is a classic Midwestern noodle casserole. 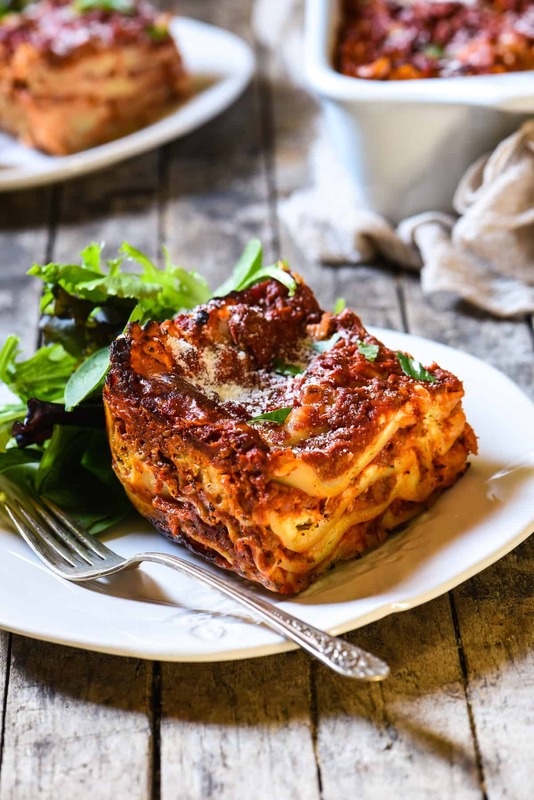 Layers of rich meat sauce, pasta, creamy filling and cheese will have the whole family coming back for seconds! I’ve mentioned a few times that my mom doesn’t really love cooking. We ate home-cooked dinners most nights when I was growing up, but I think my mom would be the first to tell you that cooking doesn’t spark joy for her the way that other hobbies do. But what’s funny is that on this blog, I feel like I’m always saying “Check out my mom’s Christmas cookies! And potato salad!,” and now, this Lasagna with Cottage Cheese that my mom often made for Christmas day when I was a kid. Hey, she has a few things that she enjoys cooking, and she does those things well. What is the difference between cottage cheese and ricotta cheese? Cottage cheese is unripened fresh cheese made from curds, which are created when milk is separated into curds and whey. Cottage cheese has a very mild flavor and a lumpier texture. Ricotta is a traditional Italian cheese made from whey and has a smoother texture. Can you use cottage cheese in place of ricotta cheese? Can you make lasagna with cottage cheese? Yes! That’s what I’m doing in this recipe for lasagna with cottage cheese, and the finished product is amazing. I recommend using small curd cottage cheese (instead of large curd), so that the curds disappear into the cheese mixture more easily. Can you use mix ricotta and cottage cheese? Absolutely. Especially if you’re new to making lasagna with cottage cheese, feel free to use half ricotta and half cottage cheese, if you prefer. Meat. You’ll need 1-1/2 pounds total meat for the sauce. My mom likes a combination of ground beef and mild Italian sausage. I like a combo of beef and spicy Italian sausage. You could also do all beef, no sausage, but I believe the sausage adds an essential flavor to this dish. Herbs. This recipe has always been made with dried oregano and parsley. If you wanted to use fresh herbs, you could, but the dried herbs are what we use. Mozzarella. 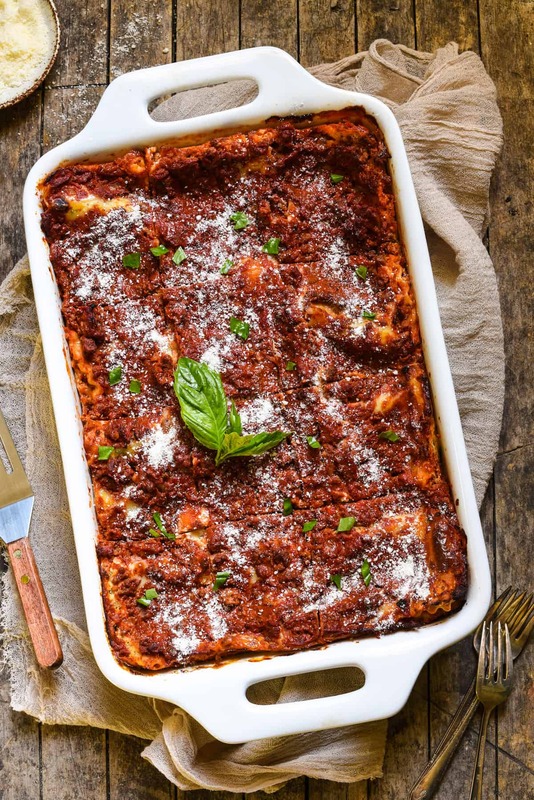 You can use shredded mozzarella, but we’ve found that this lasagna is easiest to assemble if you use the mozzarella that is sliced for sandwiches. Noodles. We use traditional (you have to boil them first) lasagna noodles. I know that they make those no-boil noodles now, but we’ve never tried this recipe with those and we don’t have any advice for how to do that. Boiling the noodles really isn’t that hard, as it happens while you’re cooking the meat sauce, anyway. Tomatoes. There is A LOT of intense tomato flavor going on in this lasagna, and I love it. 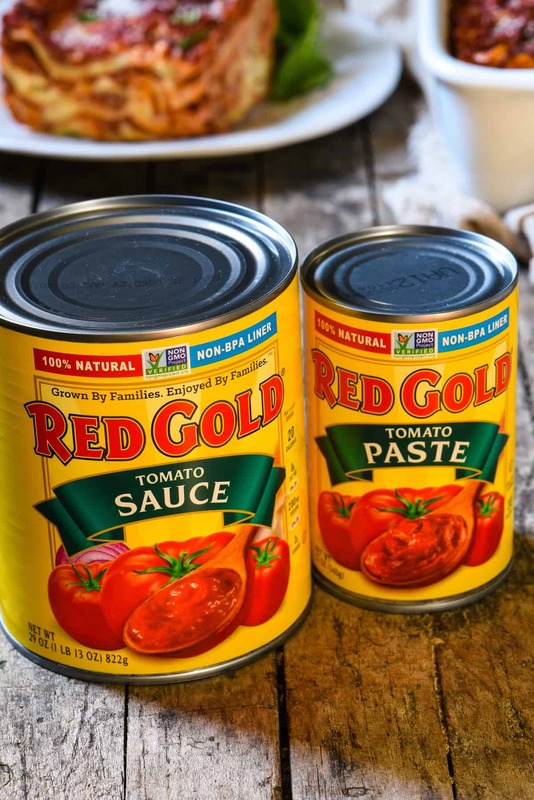 You’ll need a combination of canned tomato sauce and tomato paste, and I recommend using Red Gold for both. These tomatoes are non-GMO project verified and packed in non BPA lined cans. Most importantly, they simply taste great. Red Gold has been sustainably growing their tomatoes on Midwest farms for more than 70 years. This fourth generation family-owned company pick their tomatoes at the peak of freshness and can them in as little as three hours, ensuring the best quality. For more information, please connect with Red Gold on Facebook, Twitter, and Pinterest. Make the Meat Sauce: In large high-sided skillet, cook beef, sausage, garlic and onion over medium-high heat 10 to 12 minutes or until meat is cooked through, breaking up meat with back of spoon and stirring occasionally. Remove and discard any excess fat in pan. Stir in tomato sauce, tomato paste, oregano and salt; heat to simmering over medium-high heat. Reduce heat to medium-low and cook 30 minutes, stirring occasionally. Remove from heat and let cool slightly. Meanwhile, make the Cheese Filling: Place eggs in large bowl and whisk until smooth. Add cottage cheese, Parmesan cheese, parsley, salt and pepper; stir until well combined. Prepare noodles according to package directions; drain. Preheat oven to 375 degrees F. Spray 10 x 16-inch lasagna pan or large baking dish with nonstick spray. Arrange 1/4 of noodles in bottom of dish. Spread noodles with 1/4 of Cheese Filling. Arrange 1/4 of mozzarella cheese slices over Cheese Filling (you can rip the cheese slices into halves or thirds to arrange them easier). Spread 1/4 of Meat Sauce over mozzarella cheese slices. Repeat layers 3 more times. Transfer to oven and bake 45 to 60 minutes or until edges are bubbly. Let rest 15 minutes before serving topped with additional Parmesan cheese and basil, if desired. 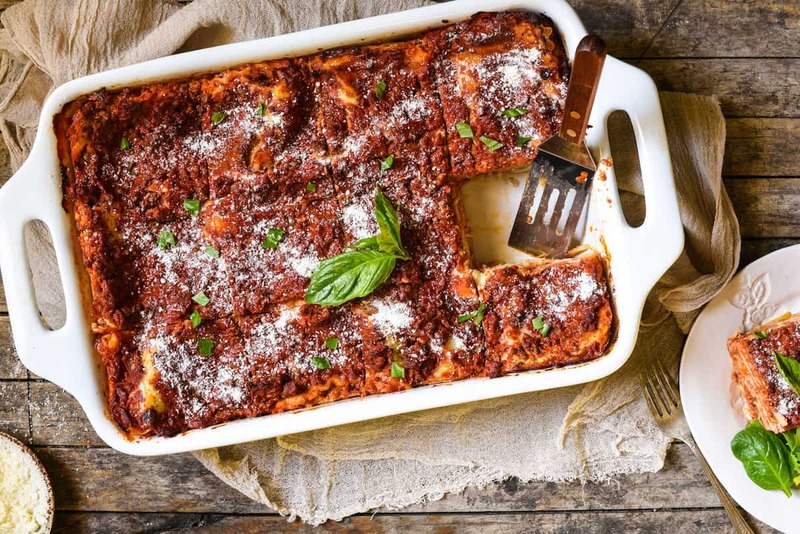 -This lasagna can be assembled, covered and refrigerated up to 3 days before baking. Bring to room temperature 1 hour before baking. 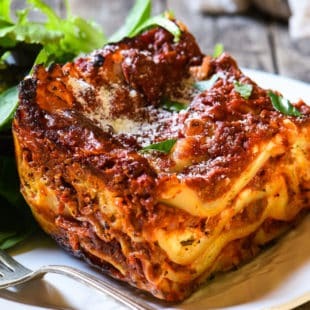 -This lasagna freezes well! What I usually do is prepare and bake the full lasagna, and then refrigerate the leftovers in the pan overnight. The next day, I remove the chilled pieces of lasagna from the pan and wrap them individually in plastic wrap, then foil. I freeze the pieces in freezer bags. To reheat, I unwrap as many pieces as I need and place them in a small casserole dish with a little bit of water in the bottom. I cover the dish with foil and bake at 350 degrees F until they are heated through. Disclosure: This was a sponsored post written by me on behalf of Red Gold. Sponsored posts help me pay for the costs associated with this blog (groceries…lots of groceries), and help support me as I pursue a career in recipe development and food photography. All opinions are 100% my own.